*Online Premiere* Family tensions bubble as Jeong-Eun longs to escape her harsh mother while being besieged by her long-lost brother with a dark secret. “Lost Dogs” is a well-crafted and stylish dark comedy that lands in gangster movie territory but does so with a wink, never losing its sharp sense of humor. 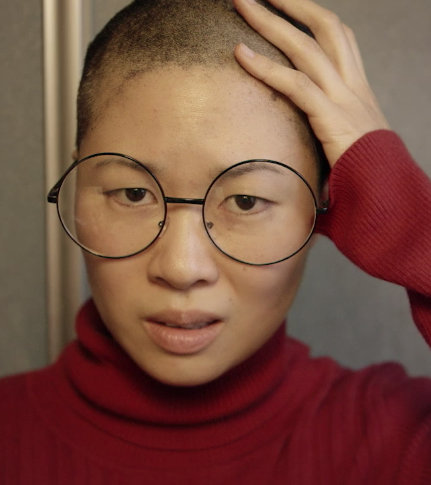 Jeong-Eun is unmarried and stuck taking care of her mother, a deeply fretful woman (after Jeong-Eun comes into contact with a neighborhood dog, she forcedly shaves her daughter’s head fearing lice in the home). On a rainy winter night, an unexpected knock at the door finds Jeong-Eun face-to-face with her missionary brother who has stumbled into quite a pickle. At first resistant to offer him help, Jeong-Eun begins to realize there may be something for her to gain as well. Directed by Cullan Bruce, “Lost Dogs” packs a lot into its 15 minutes, doing so with effortless rhythm and tension-building. Filled with rich character details and great performances, it’s a confident melding of genres about a family looking for salvation. (15 minutes) Directed and edited by Cullan Bruce. Written by Cullan Bruce and Chris Lee. Starring Chris Lee, Edward Hong, and Linda Yim. Produced by Chris Lee. Director of Photography: Lucas D. Miller.